We continue with our review of the 8th Architecture and Interior Design Awards by PORCELANOSA Grupo by highlighting a finalist project regarding Students Forward-Looking Projects. We are back again to look at the peacefulness of the sea and to focus on Ángela Acevedo’s design. 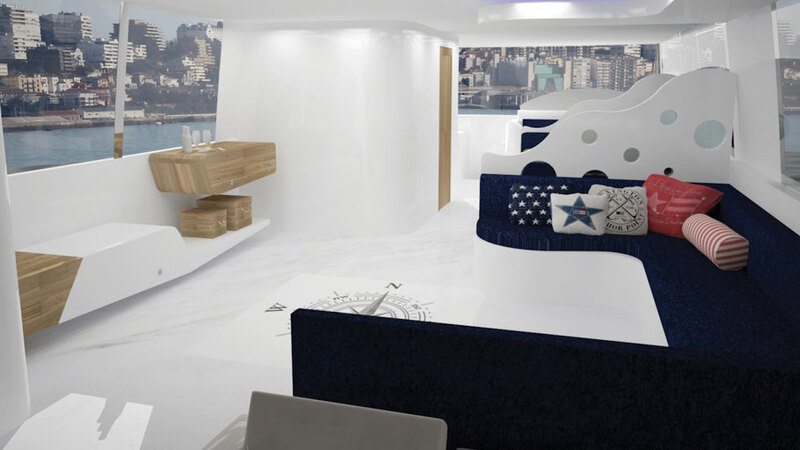 She is a high grade student of projects and construction management at VINSAC School of Design in Santander: a yacht whose interior and exterior design are based on the quality and sophistication of PORCELANOSA Grupo materials. Sea waves were the cause of inspiration in Ángela Acevedo’s project, a luxury vessel whose interior design is both warm and functional, as well as innovative and avant-garde. White and natural wood really dominate the whole project although small navy blue and red tones are occasionally present, thus, achieving a renovated seafaring interior look. The project has two cabins, one is the main one and the other is for guests, both of them situated on the lower floor. The upper floor, on the other hand, accommodates the lounge, the dining-room, the kitchen and operating controls place. In the outside area we have the deck and the fly bridge, as well as a relaxing area with seats, where we can find a jacuzzi. 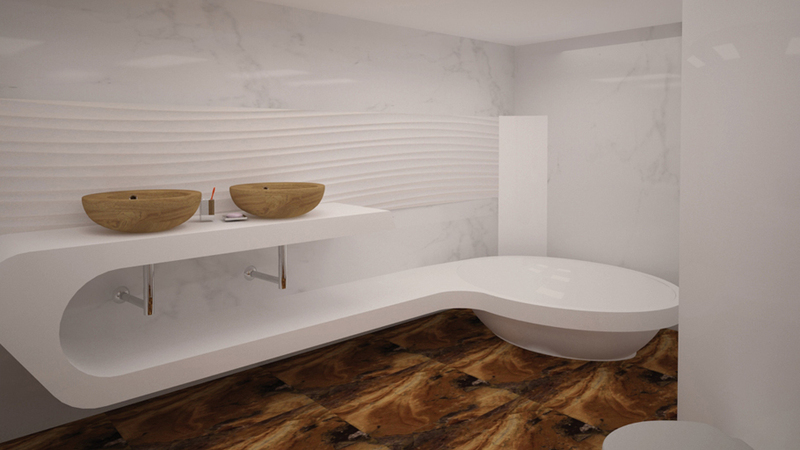 One of the PORCELANOSA Grupo materials dominating this project is the KRION® Solid Surface acrylic stone. The state-of-the-art mineral compact is present in its 1100 Snow White version, in the bathroom furniture, by joining in a same joint less design, the countertop for basin and bathtub. A unique versatility which has made possible not only the original design of the guests’ cabin furniture, which is inspired in the sea, but also the innovative furniture for the lounge. With regard to the flooring on the yacht, L’Antic Colonial materials are highlighted. 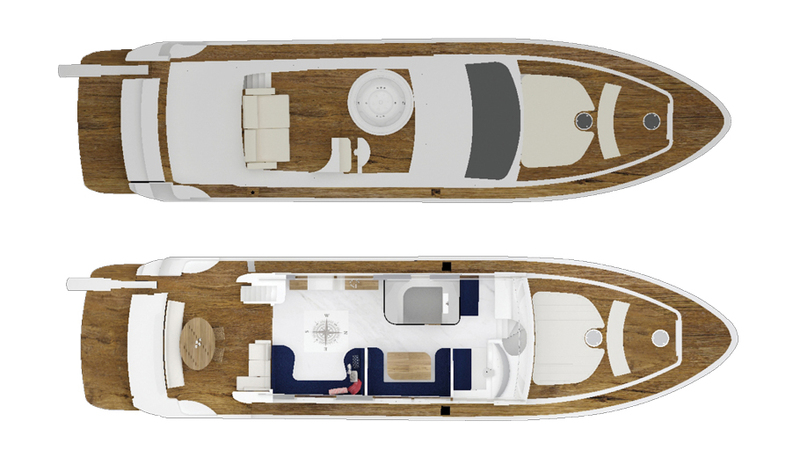 Linkfloor Project covers all the deck on the yacht, as well as some floors in its interior. 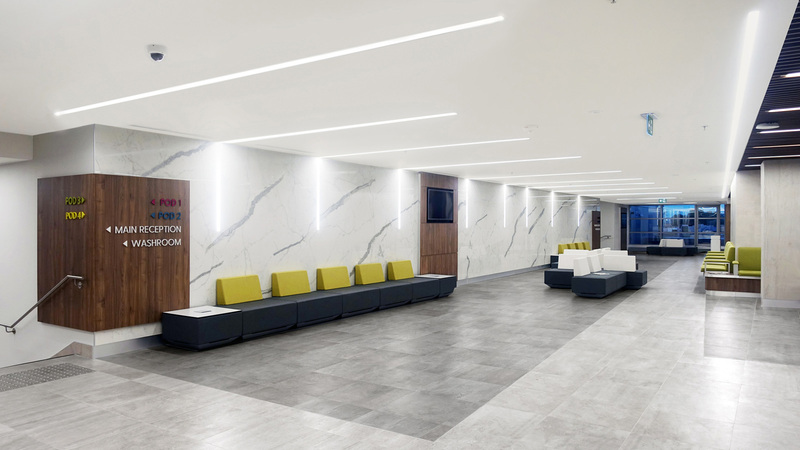 On the other hand, natural stone has been applied in this high-seas project by means of materials, such as the travertine marble in its Cross Cut Clasico Bioprot version, the Persian White Bioprot marble or the Nepal Natural Bioprot slate, among others. Wall tiles have been carried out by Porcelanosa, by means of decorated mosaics, such as Qatar Nacar, or the Deco Saigón marfil or the Flower Antracita ceramic wall tiles. Gamadecor and Noken, the PORCELANOSA Grupo firms are also present in this unique project, through the kitchen furniture, in a grey colour model; and the bathroom equipment, respectively. It is a yacht where modern luxury is merged with the warmth of wood. A classical-modern interior design, for experiencing a special exclusive voyage in the open sea.